…powered by a 550 HP 13B. 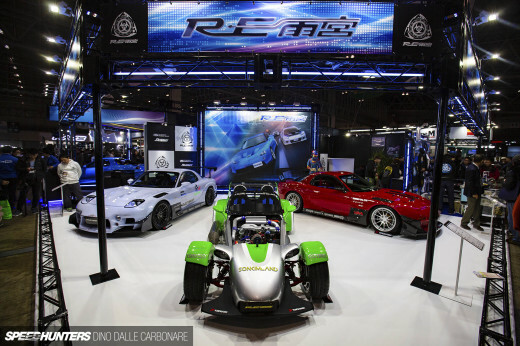 We originally saw this car at the Tokyo Auto Salon in 2010, but back then it was far from finished and it turned out there was much more that needed to be done before it could become competitive. 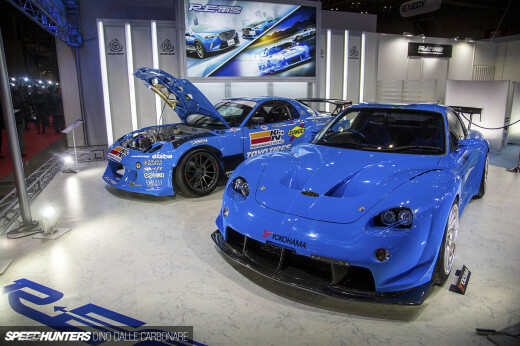 So in the year that followed it spent its time at RE-Amemiya’s main workshop in Tokyo where Ama-san devoted all his spare time to it, even fitting it with the new 2011 widebody kit. 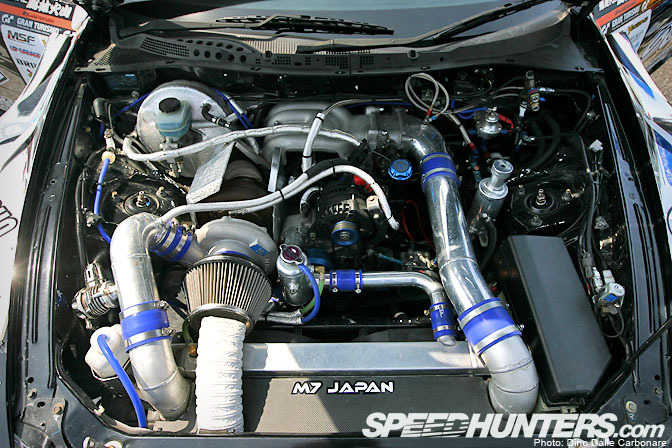 Check out how far back the 13B sits in the engine bay, all in the pursuit of that perfect weight balance. 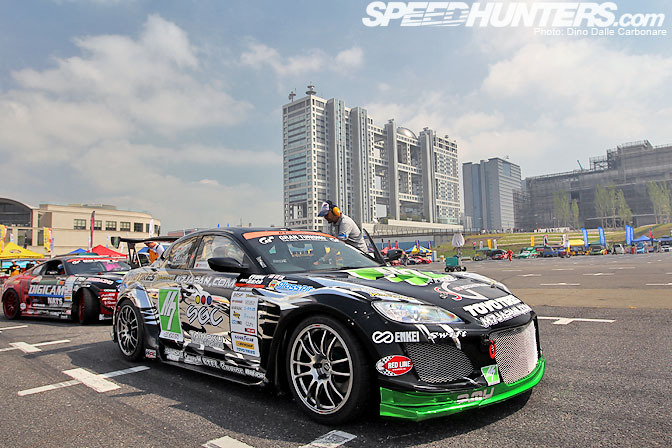 Masao Suenaga seems to have gotten more than used to the new car, putting on a great show in Odaiba with plenty of sponge-barrier-scraping antics and close car to car tsuiso runs. The rear suicide doors allow a pretty unusual view into the car’s interior. The intricate roll cage is there for safety as much as for extra rigidity. A look at the trunk area. I guess fuel cooling is very important to Amemiya-san as there are no less than three coolers that help bring fuel temps down. The two top ones look like adapted power steering fluid coolers and yes, that’s a small electric fan keeping air flowing over them! 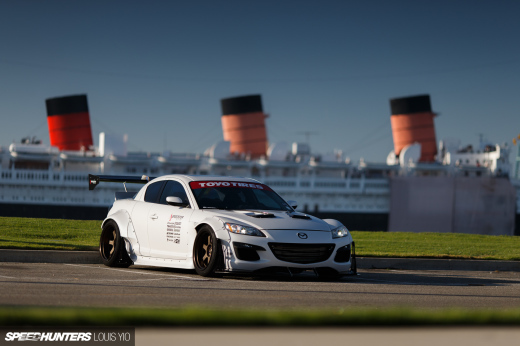 It will be very interesting to see what Suenaga will be able to do with this new RX-8 this year. He will have his work cut our for himself as the competition is fiercer than ever! the technical parts look awesome..
are you the fan master jeff lol? Those fuel system heat exchangers seem really ridiculous to me. That's an awful lot of cost, plumbing, and maintenance (let alone failure points) for what I'd like to think could be solved with in/out airflow through the trunk. Love the use of the fuel coolers and seeing how they used would be power steering coolers for this, makes it something that can be done on the home front. Nice setup. Wonderful build here. Great write up. looks ferocious.. very busy inside the cockpit! looks very fuctional in the boot tho' - all in all.. purposeful. not digging the front end at all! I love the look of the "desk" in Suenaga's office! It's a shame they have to transplant a nearly 30 year old design in the 13b, bc the Renesis isn't suited for motorsport. Here's hoping Mazda's next rotary in the works will make up for it. There is no point in complaining about the fuel setup. It's his preference not yours. He has the money to spare for extra "security". All in all, everything goes and makes sense.